I am a friend of 99luftbalut and he had directed me towards your great forum. I too am a Philippine sword collector and have lots of questions about the Insurrection era weapons. 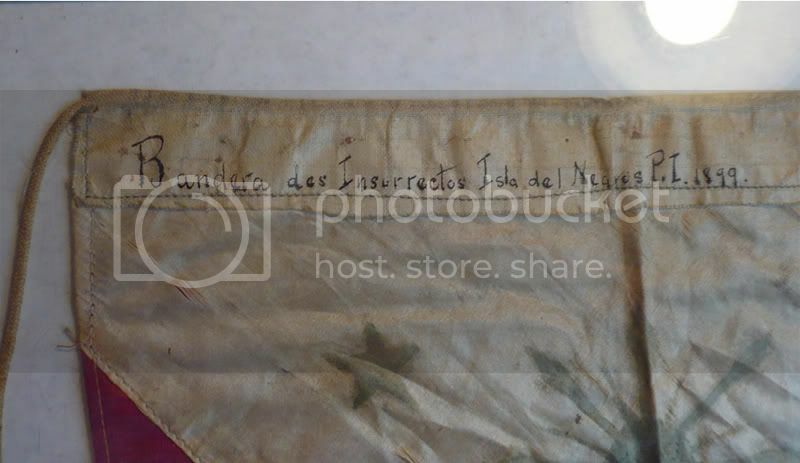 First off, I have a silk flag that is self explanitory. The inscription gives its provenence. I would assume it was a part of Lacson's group. The Sun does have a face, but it is faded. The following sword has an iscription that intrigues me. It translates into "Philippine Militia", but who was the "Militia"? The sword was bought in a lot that had other Insurrection era swords. Pre 1910. Any information on these items is appreciated and thanks in advance. 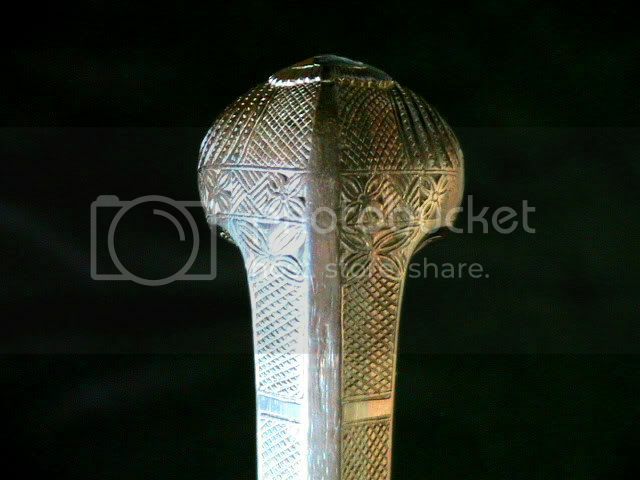 The sword's make is of the Visayan Barong. 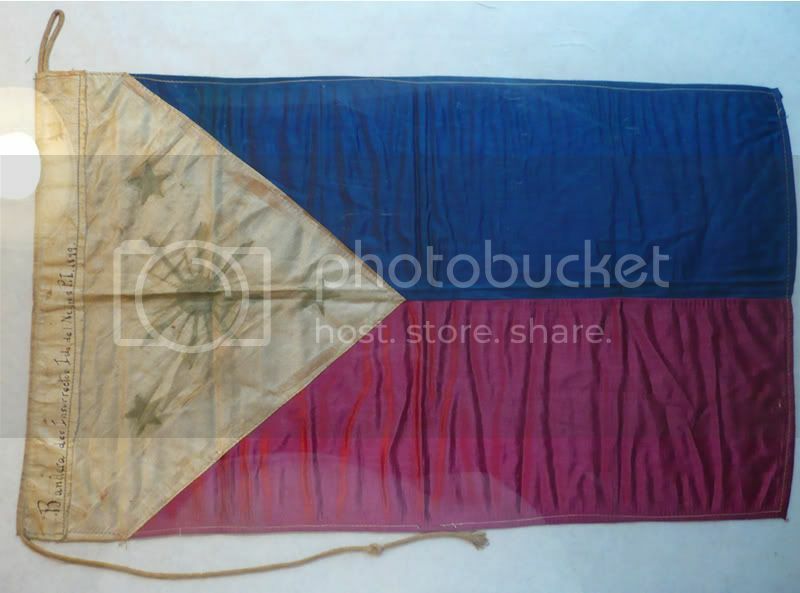 Did it came from the Visayas like the flag? It has a beautiful "closed fist" handle. 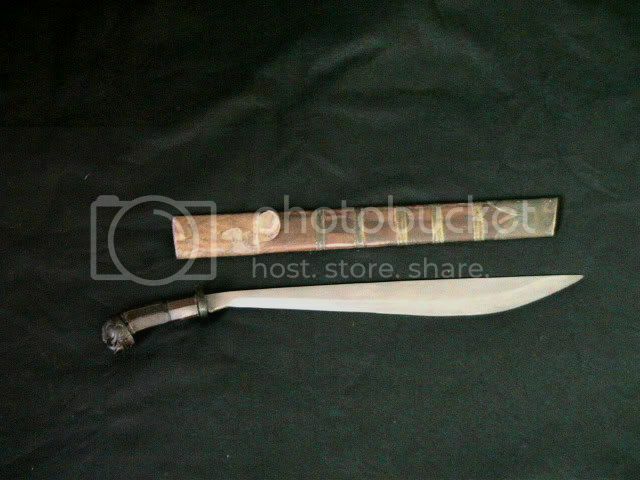 I think I've seen pictures of barongs with handles similar to this, I can't remember. 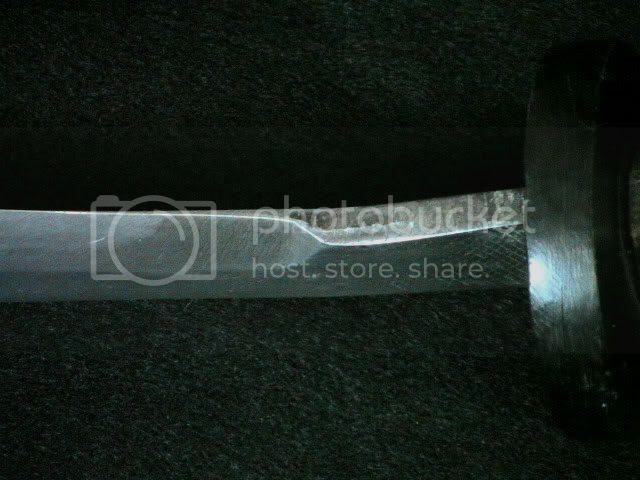 There are also marks on the opposite side of the blade that the sword was hit to be able to cut something. As for the incription "Philippine Militia", I'm not sure if it's the militia formed by the Spanish colonial government to fight the katipuneros/revolucionarios or the civilian militia (posse) organized by local presidentes during the American occupation to hunt down so-called bandoleros (revolucionarios who did not surrender to American rule). A beautiful piece indeed. 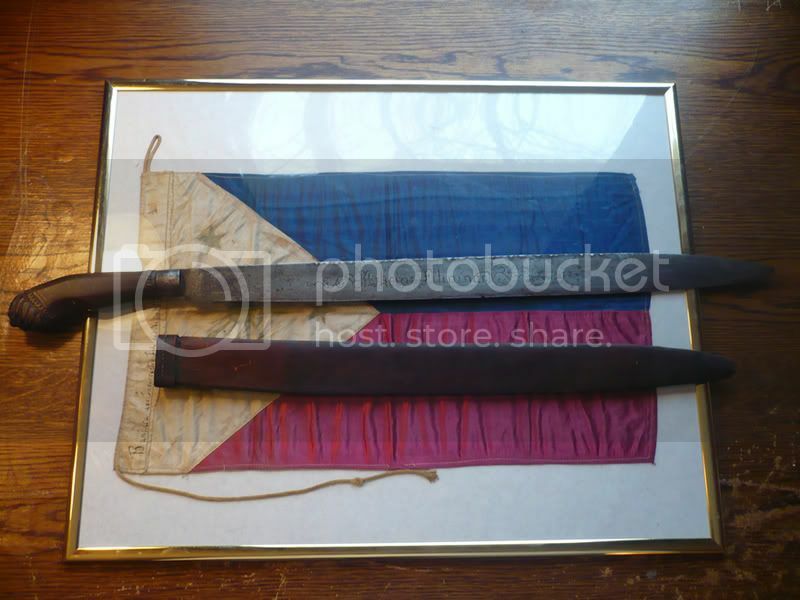 the sword did not come from the same lot as the flag and is actually from luzon. the swords hilt is not of the closed fist variety. it actually is like a closed up twisted flower. i've never heard of a visayan barong? do you have pics of one? oh i see... looks like a closed fist in the photo. a visayan barong is somewhat similar to the barongs used by the juramentados of the muslim south. It has a thick blade and looks like a leaf. A Visayan barong is the slim version. if you can post a pic of the visayan barong, it would be greatly appreciated!! 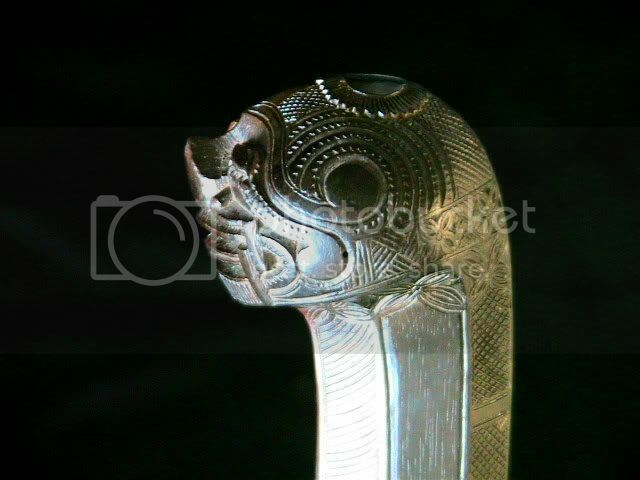 btw, what is the meaning behind the closed fist hilts? i have several examples, but have never determined the symbolism behind them. I assure you its not a Pinuti from the Visayas. This is definitely Luzon made. I am curious to see the "lion heads" you mention, and also the Visayan Barong beancent mentioned. Dilli Po, in Negros Oriental, Cebu & Bohol it is spelled "pinoti". My mistake... I missed the part where you wrote that the sword didn't come with the Flag, & was from Luzon, I don't know what they call it there. I'll post the photos as soon as I can get my son to help me. Pasay loah Ako, Ako si "computer illiterate". 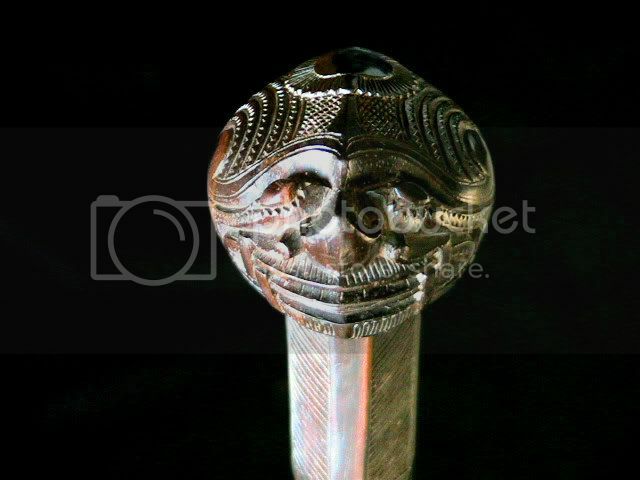 Is the hilt on the binangon covered in brass like it looks in the close-ups or is is just the way the pictures turned out? If you would, please post pictures of your collection as I am also a collector of Phi Am war weapons. I think the closed fists is symbolic of 2 things at the same time - the holding of a Spanish severd head by the hair (I will try to find the pictures) and the head of ST.Paul who was beheaded by sword. BTW - I love your flag as well and congratulations on such a wonderful piece. Really glade to see you here!! The flag is on eBay for auction. On another note, a bit depressing to see that our people referred to themselves as "Insurrectos." If there is one historical reference that needs to be expunged, it is that of our people engaging in an "Insurrection" (eg: Blair and Robertson's "Records of the Philippine Insurrection") What happened in 1899-1902 was a proper Revolutionary War by a people struggling to be rid of US colonialism. "Insurrection" carries with it a lot of implications, all of them wrong. 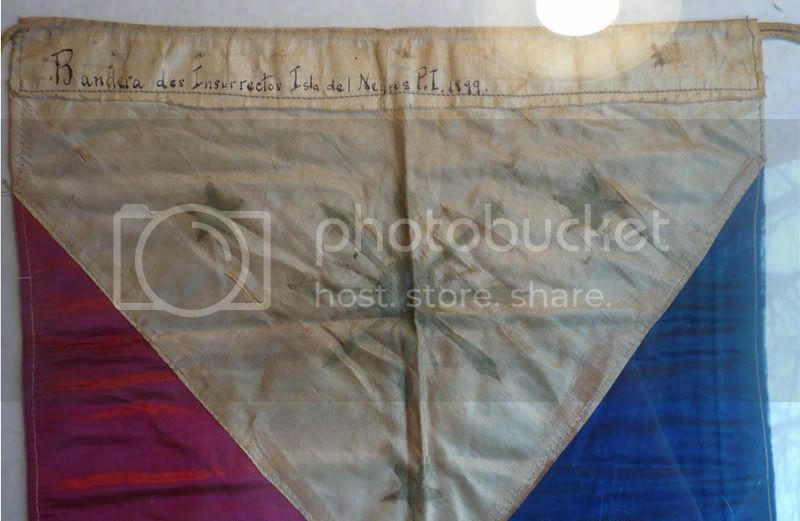 If I did win this flag I actually would have donated it to a museum that would preserve and take care of it. Auction ended at $830, and the reserve was not met. This flag never be sold to a casual collector. If it was to be sold, it would be to a serious collector in the Philippines, or as you have stated, donated to a museum. The flag is stored in an air tight container away from humidity and light. It has only come out about 6 times in the last 3 years. The value of the flag is priceless to us, you and I. Take it off eBay. Now. Please. We all need to get that extra moolah in our bank accounts sir, that I understand; but please, not like this.